There are few more important avenues for ensuring continued progress toward a better U.S. food system than teaching children about healthy food that is produced sustainably, humanely and fairly. Pilot Light, a chef-driven nonprofit in Chicago, is one of the most promising and innovative programs addressing this priority. Pilot Light works with Chicago Public Schools to integrate food education into the curriculum for youngsters in selected elementary schools. The program was inspired by first lady Michelle Obama’s “Let’s Move” program promoting fitness and better nutrition for children, and was created in 2010 by some of Chicago’s top chefs, including program mainstays such as Paul Kahan of the One Off Hospitality Group; Matthias Merges of Yusho, A10 and Billy Sunday; and Jason Hammel of Lula Café. The lessons are calibrated to the children’s age levels and to the subjects they are being taught in the overall curriculum. 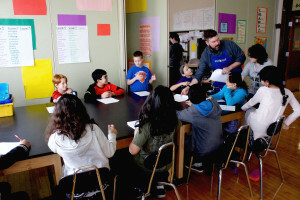 Teachers at the participating schools prepare the students on food-related topics, and the chefs take over classrooms on occasions throughout the school year to expand upon the subjects. For example, the chefs’ day on Feb. 29 at the Disney II Magnet School in Chicago’s Old Irving Park neighborhood (attended by FamilyFarmed and shown in the photos accompanying the article) had the following lesson plan: Kindergarten — How to Write a Recipe; Grade 1 — Families Around the World & Their Signature Rice Dishes; Grade 2 — The Great American Mixed Salad; Grade 3 — Food & Changing Chicago: Sausage Demonstration; Grade 4 — Regions of the United States & Their Popular Dishes; Grade 5 — Math is Everywhere: Examining Recipes; and Grade 6 — Three Sisters Garden. 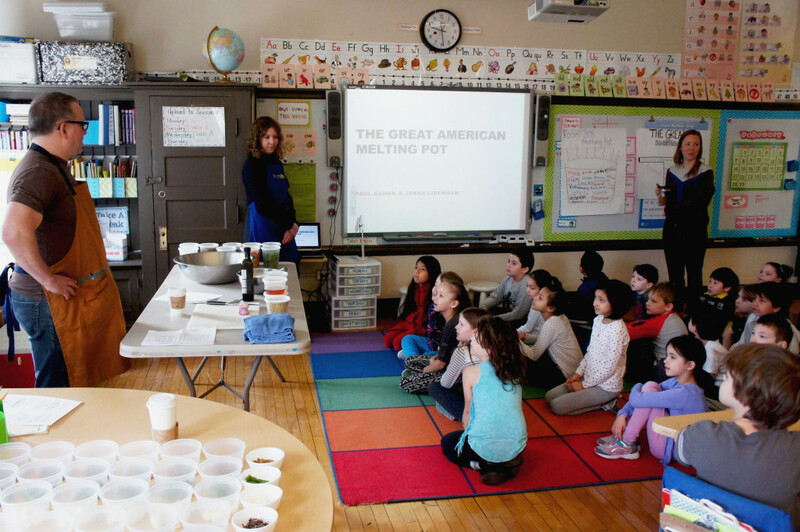 Chef Paul Kahan and One Off Hospitality Group colleague Jenna Liberman (blue apron) taught a 2nd grade class on the impact of immigration on how Americans eat during a Pilot Light day at Chicago’s Disney II magnet school on Feb. 29. Kahan — who led the Grade 2 discussion about food and the American ethnic “melting pot” and provides his thoughts about the Pilot Light program in the Q-and-A below — will perform a Pilot Light demonstration at FamilyFarmed’s Good Food Festival on Saturday, March 26. He will be joined by Josh Kulp and Christine Cikowski, chef-owners of Chicago’s Honey Butter Fried Chicken and Sunday Dinner Club, who are also very active in Pilot Light and taught the Grade 4 class in regional U.S. foods on Feb. 29. Merges and Hammel, other Pilot Light co-founders, delivered the Pilot Light program at the 2015 Good Food Festival. Kahan also will be honored at the Festival on March 26 as FamilyFarmed’s Good Food Chef of the Year. To read more about his career as a top chef devoted to local and sustainable sourcing, please click here. 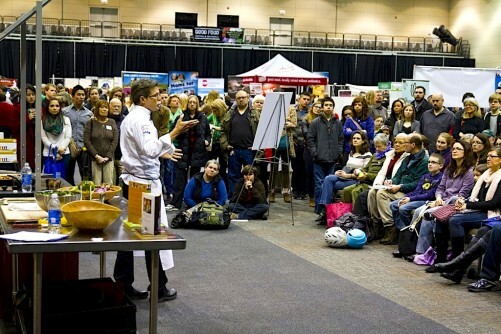 To learn more about FamilyFarmed’s Good Food Festival & Conference, click here. To purchase tickets, click here. 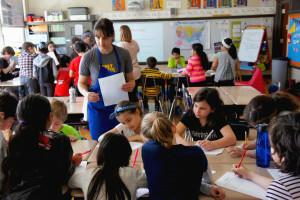 Pilot Light chefs Christine Cikowski and Josh Kulp, of Chicago’s Honey Butter Fried Chicken and Sunday Dinner Club, taught a 4th grade class on regional U.S. foods on Feb. 29. Kulp was a grade school teacher before pursuing a career in food. 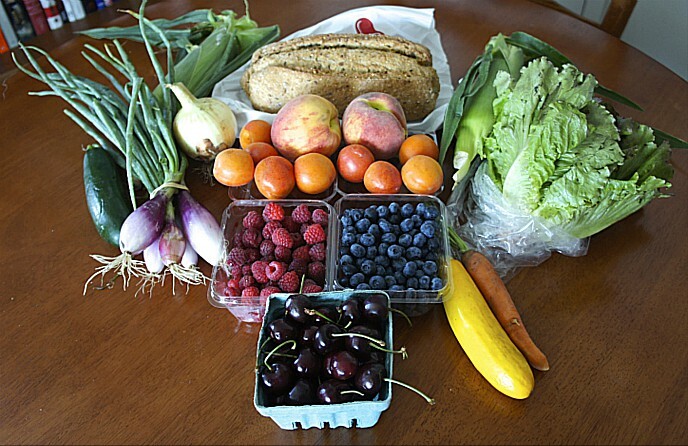 One of the Pilot Light program’s goals is to encourage children to try a wide variety of foods and to be open-minded, especially when it comes to healthy items such as vegetables, fruits, nuts, and whole grains. The program also hopes to inspire kids’ interest in preparing food themselves, which will be the focus of the Pilot Light demo Kahan will lead at FamilyFarmed’s Good Food Festival on March 26. Me and the kids from Honey Butter are going to do demos of things that kids can cook with their children. Super simple stuff. We’re going to do a farmers cheese fettunta, with 1979 [a whole grain bread produced by Greg Wade, head baker at Publican Quality Bread, part of the One Off Hospitality Group]. It’s another word for bruschetta. In Tuscan it means “greasy garlic bread.” We’re going to do local honey and hazelnuts and ricotta. Super duper simple. Kahan on how the everyday logistic and business challenges in running restaurants pale in comparison to the big-picture issues faced by the nation’s children, and how Pilot Light is structured to help address those issues. 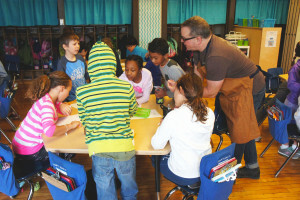 Paul Kahan, Chicago chef and co-founder of the Pilot Light teaching program, discusses the ingredients being sampled by second-graders during a Feb. 29 class. So I talked about Pilot Light and I talked about when we go into schools, we just did a lesson last week, in the 2nd grade classroom, that’s where the hope is. Connecting kids with food and teaching them at an early age is the only hope that we have at this point. Pilot Light is a big deal in that regard and it does work… Those kids are incredible, and they’re from every race, creed, socioeconomic background. There is a way to be successful, but it requires people to care…. It’s about professional development of teachers, it’s about community engagement… It’s about a buy-in from the schools, the principals, and it’s about paying the teachers to teach the program via the not-for-profit, not a large sum of money, but $1,500 a year for a teacher to engage the program and principal who buys in, a screening process. Kahan believes that for Pilot Light to reach full fruition and reach many more of Chicago’s schoolchildren, it eventually will need its own professional development and training facility. Ideally we want to buy a building and build a kitchen and have it be a center for professional development and community and food. That’s where our vision is at right now, and we’re starting to move on that. The idea of a chef teaching a lesson with food in the classroom and then cooking in the cafeteria, that is the world’s greatest idea for education and children’s lives, to have a healthy relationship with food, but it’s not sustainable, you can’t do it. Culinary professionals, chefs, they’re like, “I want to help.” That’s great, it’s awesome. But you can’t count on them. They’re busy people, our industry is hard, there are times when my brain is going to explode because I have all of my work and our growing business, and I have three or four things I have to do for Pilot Light that week, a lesson, a board meeting, this, that. But I do it because I can’t not do it. About how Pilot Light came into being after Kahan, fellow top chef Matthias Merges (Yusho, A10, Billy Sunday) and others from the Chicago culinary community attended the introduction of first lady Michelle Obama’s Let’s Move fitness and nutrition program at the White House. Thank to the Pilot Light program, students of Chicago’s Disney II Magnet Elementary School ate a better lunch than many grown-ups on Feb. 29. 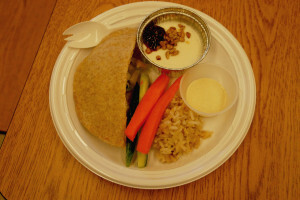 The plate included a chicken hot pocket, brown rice, carrot and cucumber sticks, and a sesame butter/jelly/yogurt dessert, all donated and prepared by top restaurants and chefs. Matthias had asked me if I was interested in helping out on a program he was thinking about at Disney II, just some demos in the classrooms. We had coffee before that meeting… We met again and thought no one is really offering what we think is the best solution to the problem. We have this analogy of, you put a salad bar in a school… and the majority of the kids are going to turn their noses up at it and walk by. But in the classroom, if you go to the Green City Market and get 10 different varieties of heirloom tomato and seven different varieties of cucumber and you hack them up on a table and you put a little olive oil on them, a little salt, and you talk about what they are and where they’re from and what heirloom is and what makes them all so special, the kids are going to go to the salad bar that day and they’re going to eat the food. That’s kind of the educational component… That’s at its most rudimentary level. About the preparatory work that teachers do with children in advance of the chefs’ teaching visits to their classrooms, and the sophistication of some of the answers offered by some of the very young kids, including those in a 2nd grade class who he taught about America’s ethnic melting pot and how it affects the way we eat. 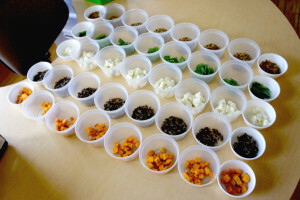 During the Pilot Light 2nd grade class on immigration and food taught by chef Paul Kahan, children sample ingredients from a variety of ethnic cultures (pepitas, snow peas, mozzarella chesse, wild rice and sweet potatoes), which were then mixed together with a Middle Eastern pistachio dressing. Some kids asked for the recipe, some kids really liked it, some kids hated it. We stress to them, you can not like it. Some kids like one ingredient individually, the pumpkin seeds or the sweet potatoes or the mozzarella, because they actually pulled mozzarella in another lesson somebody else did earlier in the year. It was about thinking about it and making intelligent choices and realizing that their tastes will change as they get older. And if they don’t like green vegetables now, they will like them as they get older and be open-minded about it. They all walk away with them. Video: See Pilot Light classroom activities in action in this short clip. This entry was posted in Awards, Chef activism, Chef advocacy, Child nutrition and health, Farm to school movement, Food activism, Food and community, Food education, Healthy eating for children, Restaurants and Good Food, School food, Sustainable food education and tagged Chicago chefs, Christine Cikowski, FamilyFarmed, Food education, Good food and children, Good Food Festival, Good Food Festival & Conference, Honey Butter Fried Chicken, Josh Kulp, One Off Hospitality, Paul Kahan, Pilot Light Chefs program. Bookmark the permalink.